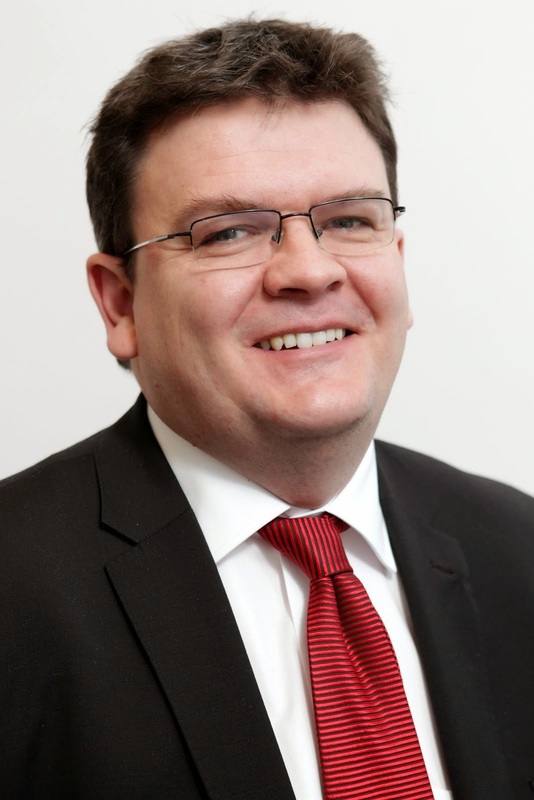 As Dundee Labour's Culture spokesperson I have today expressed my support for Dundee's bid to become UK City of Culture and hopefully in the fullness of time to become a European Capital of Culture. 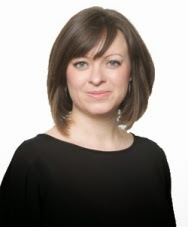 I've been campaigning for Dundee to apply for the City of Culture title since 2009 and has been disappointed at the lack of progress before now. 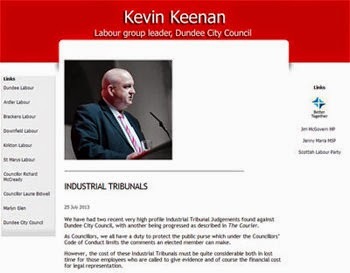 I'm delighted at the change of heart by the SNP-led Administration of Dundee City Council. Council. 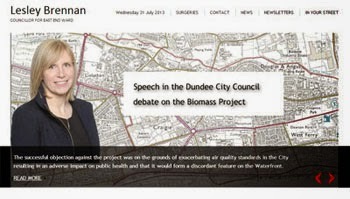 I've set up a website www.dundee2017.org.uk to allow people to register their support for the bid. 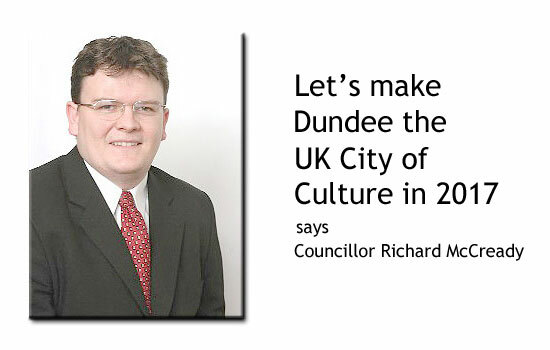 I am delighted that the council is proposing to support a bid for Dundee to be the UK City of Culture. I have been disappointed in the past at the lack of support for these proposals. It is important that the council fully backs the bid and pulls out all the stops to win this title. Dundee has a wide range of cultural venues and a vibrant local arts and cultural scene, it is important that this bid is about the whole city and that it includes and enhances the great work done in all of Dundee's communities by the many cultural agencies working in the city. People who live and work in Dundee know that Dundee is a great place to live in and work in; we have got to do all we can to convince the rest of the country to have a look at what is going on in Dundee. This bid has to be about promoting culture but it must also be about bringing regeneration and investment to Dundee. I hope that people will show their support for Dundee being the UK City of Culture in 2017 by visiting the website which I have set up to promote this campaign. 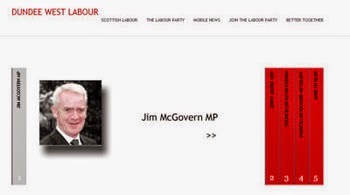 It is important that everyone in Dundee unites behind this important campaign and puts petty party political issues to one side to deliver what is best for the people of Dundee. 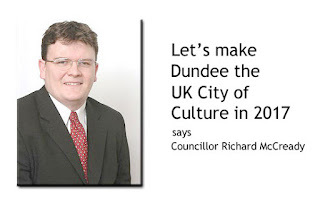 Cllr Richard McCready supports Dundee bid for UK City of Culture 2017 from West End Labour on Vimeo. On Thursday evening I was delighted to chair the Annual General Meeting of the Dundee Fairtrade Forum. It was good to reflect on the work of the forum over the last year. 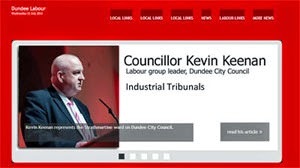 The main achievement of the forum over the last year has been to ensure that Dundee City Council updated its Fairtrade policy. 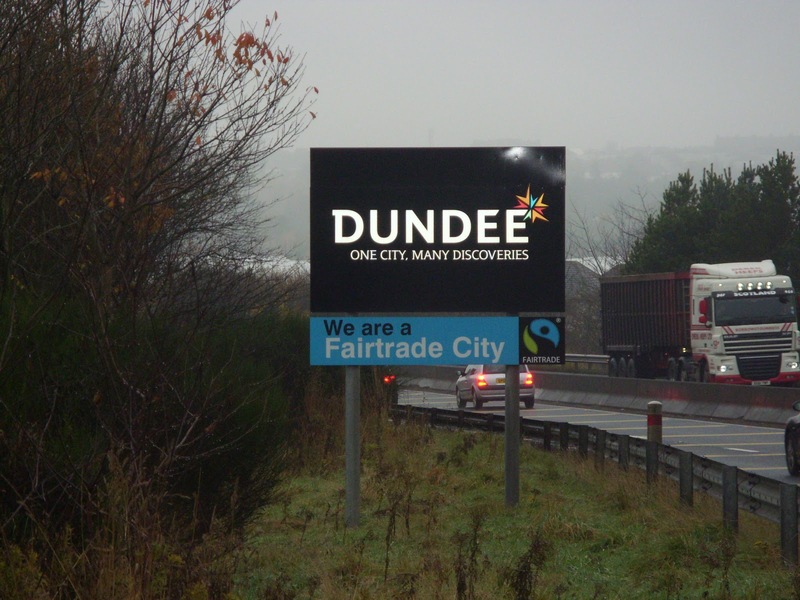 You can read the council's Fairtrade policy here and the picture here shows one of the fruits of that policy, namely signage at the entrances to the city of Dundee which proudly proclaim the city as a Fairtrade City. It is important that Dundee plays it part in making Scotland a fairtrade nation. I hope that Scotland is declared a Fairtrade Nation before the end of the year. The AGM was very well attended and included a very healthy representation from students at both Dundee University and Abertay University. There was a great selection of fairtrade stalls and good to see Abertay's Save the Children Society raising money by selling Fairtrade cupcakes. It was good to watch very interesting video from New Zealand on Fairtrade coffee which looked at the production of Fairtrade coffee in Colombia. You can see the film below.